The New York Yankees have been surprisingly excellent this season, with a 27-17 record and a unique, likable young star in hulking, homer-bashing rookie Aaron Judge. Their rich history and success on the field should make them the hottest ticket in town. And yet, they aren’t. Yankees czar Hal Steinbrenner, perhaps too swayed by many half-assed op-eds, blamed “the millennial problem” for baseball’s lower popularity among younger people. Rainouts and the team’s poor record in the recent past have contributed to lower attendance, and the decline has affected the arcane structure of the team’s stadium bond financing. Last year, ticket and suite revenues declined $46 million. It was a sharper-than-expected drop that was cited by Moody’s, the bond rating service, as a factor in its decision this month to downgrade the outlook of the $1.2 billion in stadium bonds to negative from stable. 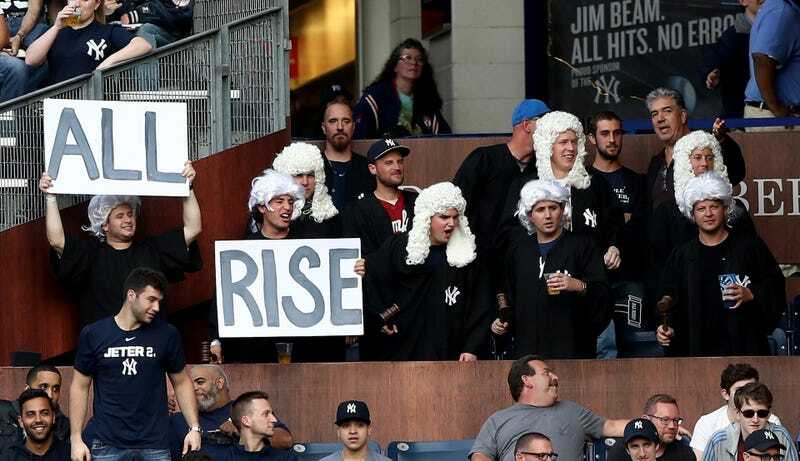 The team has slashed some prices and opened up new areas, including a courtroom-themed “Judge’s Chambers” area where fans can swill beers, wear fake powdered wigs, and cheer on the Yankees rookie. It’s also still early in the season, and the weather will get warmer and more enticing for going to a game. If the Yankees maintain a strong presence in the race for the pennant, attendance could tick up. That might not solve their deep-seated issues, but the Judge bump could still be in the pipeline. What&apos;s Your Favorite Derek Jeter Moment?